The holiday bungalows are in a small, rurally situated holiday residence, to the south of Orosei. They are surrounded by olive groves and feature a wonderful view of the sea. Owing to the quiet location they are ideal for relaxing and enjoying the sea.The holiday residence has two comfortable bungalows, each consisting of two adjacent, tastefully furnished residential units. The terrace is divided into two halves. Owing to the ventilated location, the accommodation has a pleasant temperature even in the summer months and therefore there is not air conditioning. All around the bungalows there is an enclosed site of around 4500m² planted with olive groves and almond trees. The garden is ideal for strolling under the trees and enjoying peace and quiet. Children can play here undisturbed. 2 characteristic grill made of natural stone are availables. There is car parking space on site gratis. The lovely beaches are about 2km away. Orosei offers a good range of shops and is about 2km away. There are also many restaurants and bars. There are small leisure boats from the tourist harbour with various routes, so you can get to know the coast; The property offers typical products, free wi-fi and tourist guide; If you want you can enjoy breakfast, lunch and dinner at the Restaurants in the agreement paying a supplement, to be agreed upon before arrival. the apartments can accommodate up to 4 people. They have a kitchen with a dining table, chairs and a modern kitchenette, which is equipped with 4 gas stoves, a microwave and fridge and freezer. The sofa can be turned into a double bed. The television is equipped with digital terrestrial reception. 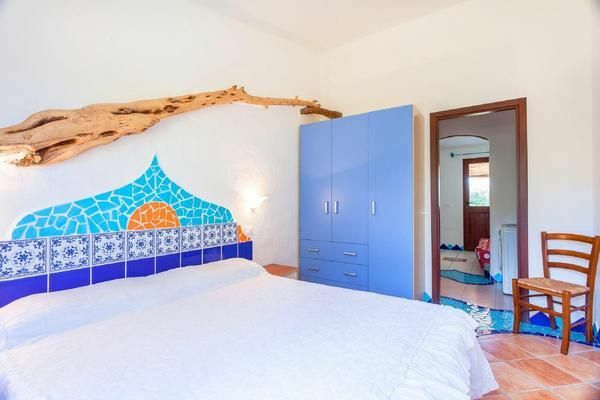 The bedroom wall is nicely furnished with tiles, where the boss is part of the double bed (180x190cm). The room is also furnished with a wardrobe. The bathroom (shower, washbasin, toilet, bidet, washing machine)) walls are decorated with characteristic tile motifs. The veranda is furnished with a table and chairs and an ideal way to take meals or just relax with a good book and enjoy the view. On the porch there is a private outdoor shower with hot water. - Cot for children: once per object for rent at a price of 30 EUR (optional). - Pet: once per object Costs amounting to 50 EUR (Mandatory). - Final cleaning: once per object Costs amounting to 60 EUR (Mandatory). - Bed linen: once per person for rent at a price of 7 EUR (optional). - Towels: once per person for rent at a price of 8 EUR (optional). Bed linen (once per person, vorhanden 7 EUR). Cot (once per object, Costs amounting to 30 EUR). Towels (once per person, vorhanden 8 EUR).